The Palestinian people are experiencing the 47th year of military occupation of the West Bank and Gaza. The siege by the Israeli army and the economic blockade have devastated their daily lives so that 'normal' life is impossible. Negotiation has failed to bring change, so PSC advocate using economic sanctions to bring pressure to bear on Israel. 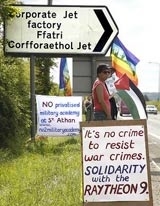 The Boycott Israeli Goods (BIG) campaign is a central part of this policy. Vegetable exports to the European market are crucial to the Israeli economy, amounting to some 80 per cent of total exports. The UK continues to be the largest market, taking 60 per cent share of export volume. Potatoes, capsicum, fresh herbs, dates and cherry tomatoes, generated the highest returns to Israel’s growers in 2004-5. 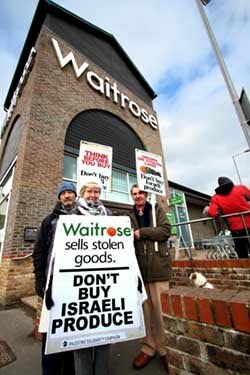 Boycotting these goods and the shops that sell them could help force Israel to the negotiating table. CLICK HERE to go to the BIG website. You can see a list of products and brands from Israels illegal West-Bank settlements by CLICKING HERE (opens in a new window). Resisting the sale and export of weapons to apartheid Israel is a direct way to challenge the state's support for Israel's military occupation of Palestine. Israel's occupation and repression of the Palestinians is perpetuated by a steady flow of arms for Europe and the US. Britain is the 4th largest exporter of arms in the world and plays a significant role in arming Israel. PSC is calling for campaigners to lobby the government to stop arms exports to Israel and to directly challenge companies in the UK who are manufacturing arms for Israel, either directly or indirectly.